Production by: Blumhouse Productions, Blinding Edge Productions in association with Dentsu, Fuji Television Network & Fuji Eight Company Ltd.
Three teenage girls are kidnapped by a man diagnosed with spilt personality disorder. The girls work to figure out his twenty-three personalities trying to find just one that will help them escape. The longer the girls remain captive, the more personalities come out. A twenty-fourth personality may be more terrifying than anyone could imagine. M. Night Shayamalan’s latest twist ending movie attempts to recapture his glory that made him one of America’s favorite directors in the early 2000’s. Everything about Split looked good going in from the concept to the trailer. Everything except that it was directed by M. Night Shyamalan. I've actually enjoyed Shyamalan's later movies more than most but even I was starting to lose faith in him as a director. Split starts strong. James McAvoy gives a wonderful, sometimes humorous performance as a man with multiple people living inside his mind. The lead female actress Anya Taylor-Joy from Morgan and The VVitch, may have met his performance with a less layered but equally if not better portrayal. The movie slowed towards the middle to the point I thought Shayamalan might lose this film as he's done with so many others in the past. 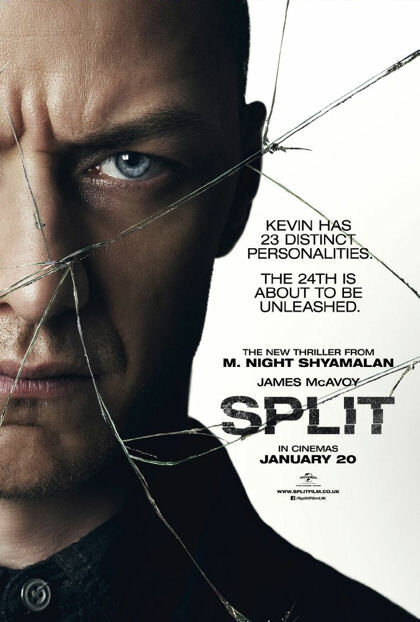 It was at this point Split went from creepy and disturbing to almost humorous as we’re lulled into a comfort zone with McAvoy and his captives. As we all know, Shayamalan is known for his twist endings. No spoilers here as I won’t go into detail. I will however say that about halfway through the film, I saw the potential for where this movie could go. I just didn’t expect Shayamalan to actually take it there. For all the performances I enjoyed in Split and how much I liked the early aspects of the film, it was the ending that put the film over the top. They followed the potential I saw. They did what I didn't expect them to do.